2) Andy Revkin comments on DotEarth on the limits of Japan’s disaster memory in response to a fascinating Associated Press article by by Jay Alabaster – Tsunami-hit towns forgot warnings from ancestors. 3) And Andy Revkin also wonder’s whether nuclear power is simply too brittle to be a resilient power source. 4) Richard A. Kerr writes in Science Magazine article Long Road to U.S. Quake Resilience about recent NRC report that argues that it is underfunding programs to develop resilience to Earthquakes. 5) New York Times on how Danger Is Pent Up Behind Aging Dams. Apparently of the USA’s 85,000 dams, more than 4,400 are considered susceptible to failure, but governments cannot agree on who should pay for renovations. 7) In New York Times Leslie Kaufman writes on complexity and resilience of Gulf of Mexico’s ecosystems response to BP Oil Spill. so I felt compelled to offer my insights. The way you and I did our searches differed, but perhaps you’ll be interested in our findings. 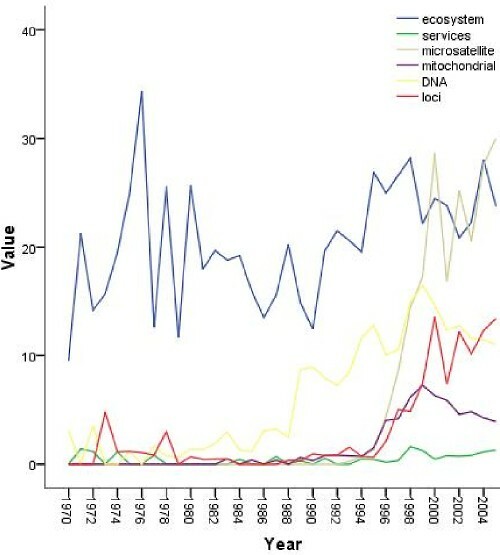 The field of ecology (as defined by the ISI ‘ecology’ journal classification, which includes your top five ‘ecosystem service journals with the exception of PNAS) has grown significantly over the past couple of decades, from 914 articles in 1970 to 10,488 in 2005. Assuming you searched for those terms in the ‘Topic’ field of the ISI WOS database, the results identify all articles with those terms in the title, abstract, author keyword, and indexer assigned keywords. You would have to normalize by the total number of words in all of those things in indexed publications to identify an increase relative to the number and length of indexed publications generally (and the number of journals, publications per journal, and number of words in titles and abstracts are all increasing). Just to give you an idea, the total number of words in titles of articles in ecology journals – which takes into account the increased number of articles and increased title length – grew over 300% between 1990 and 2005. Also, what ISI indexes (keywords, abstracts, etc) has changed over time and is not consistent across journals. All of these things really complicate attempts to see trends in ecology over time. The most reliable way I found to analyze trends in the discipline using the publication record is to limit your search to article titles because ISI has been consistent in the way it indexes them (of course, this introduces a suite of problems itself). 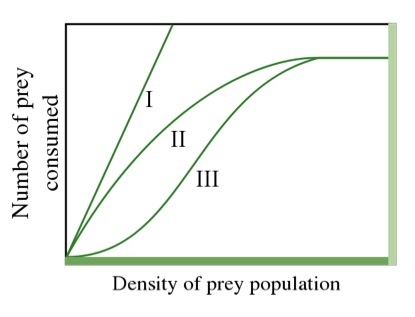 Then, you have to normalize by the total number of words in titles to get an idea of the relative growth in that area compared to the rest of ecology. If you search only in titles and normalize for the total number of title words each year, the graph of trends for ‘ecosystem’ and ‘services is unremarkable compared to others. Most notable is the increase in molecular genetic terms and topics like climate change, tropical forestry, and biodiversity. I’ve included one graph comparing the normalized trends in ‘ecosystem’ and ‘services’ to molecular genetic terms show you how the growth in that topic compares. Note that the y axis is not a number of publications, but rather is a ratio of title words to the total number of title words that year, with a multiplier to ease comparison of the various graphs in our study to one another. 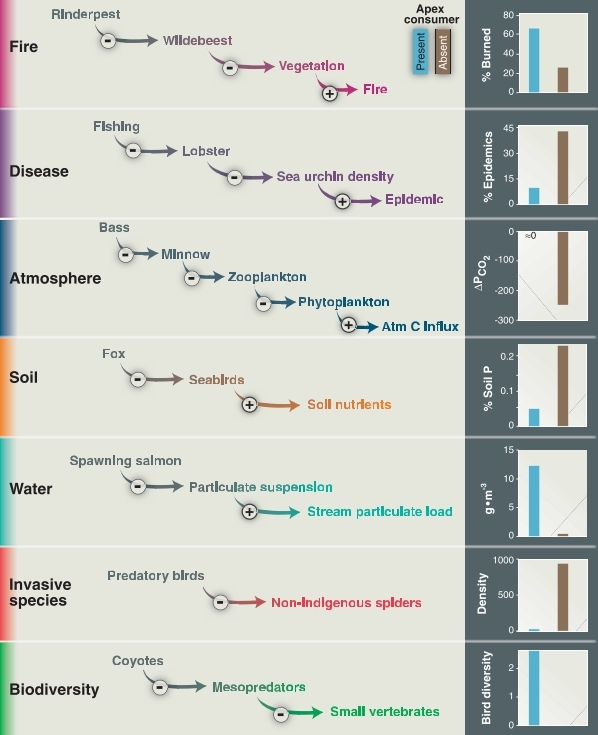 Our 2009 paper contains more graphs of recent trends in ecology. Perhaps the biggest trend is the sheer growth in the field, but I have no idea how that compares to the growth of the scientific enterprise writ large. In the Congo Republic a survey has discovered a large population (125 000) of Western lowland gorillas. Oceanic food webs shifting to dominance by jellyfish, due to overfishing of top predators, and likely coastal eutrophication and climate change. Although ecology would in theory claim a holistic remit that includes humans as part of earth’s biota, its usual practice has reinforced humans as different (Haila, 1999; 2000), with anthropologists more likely to consider humans within an explicitly biogeographical perspective (Terrell, 2006). A recent contents analysis of mainstream conservation biology journals shows a continued focus on relatively ‘intact’ habitats, with few studies ‘conducted entirely in areas under intense human pressure (agricultural landscapes, coastal and urban areas)’ (Fazey et al., 2005: 70). Changes can be seen as part of the so-called ‘new ecology’, or ‘non-equilibrium’ ecology, in which change and contingency rather than stability is the norm, and ‘disturbances’ such as fire and human actions are understood as internal to the system rather than external. An integrative brand of ecology is practised by the Resilience Alliance, published mostly in their journal Ecology and Society. 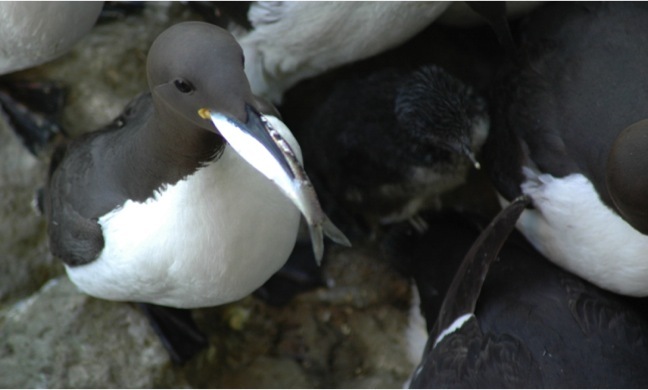 The Alliance works through interdisciplinary collaborations to explore the dynamics of social-ecological systems, using key concepts such as resilience, adaptability and transformability. The approach is avowedly integrative of ‘ecology’ and ‘society’ (eg, Gunderson et al., 2005) and acknowledges the pervasiveness of humans in ecosystems (Elmqvist et al., 2003; Folke et al., 2004; Trosper, 2005). Yet the assumption of separate systems remains curiously unexamined in this work. Further there is conceptual slippage between treating humans as different, and ultimately absorbing all human activities as part of ecosystems.